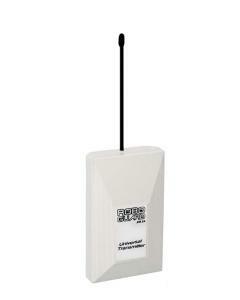 The Roboguard Universal Transmitter is designed to interface non-roboguard products into the wireless roboguard system. An added benefit is that the universal transmitter will supervise the communications link and report Roboguard trouble alarms if there is a problem. This can also be the case if there is a fault with the external system. This means that electric fence alarms, pump alarms, in fact any product that has an electronic or electrical output can now be added into the roboguard system. Each universal transmitter has four inputs that can be wired in from the external product. The universal transmitter will monitor these inputs (alarm outputs from the external product) and will send an intruder or tamper signal depending on its configuration. The Universal transmitter can also be configured to emulate the Roboguard hand held remote transmitters. The Universal transmitter can be configured as a repeater station with the addition of a Universal Receiver. In this configuration the transmitter will transmit any received roboguard signal with a user configured delay. This is most useful for sites where radio signal transmission is problematic.